The Cheonggyecheon brook. Money stream from Seoul. 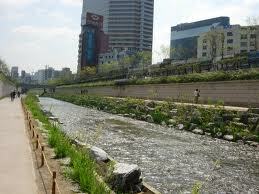 There is a brook along the whole Seoul centre, the citizens and tourist like walking here. Fountains play here and banks are faced by decorative tiles and good facing stones. Water makes fresh microclimate at the riverbed which is particularly pleasant in sultry summer. This place is described in all new Seoul’s guidebooks. This stream is called Cheonggyecheon and it has its own, very interesting story. On the one hand it’s too unusual, but on the other hand it characterizes modern South Korea. It would seem what history can this paltry brook have? In fact this rivulet was here all the time. It played an important part in Seoul life: as far back as in the first half of XV century there were great deepening works according to Korean king’s order. After Korean war, in the 50s the district around the river was very demolished, a lot of shacks appeared along the banks because of emigrant influx from North Korea, and sewage flew into the Cheonggyecheon. It changed into stinking cesspool. In 60s the local authorities decided to struggle with those insanitary conditions. They pulled down the slums, resettled people, put the brook into underground pipe and built a motorway above this place. The plan was fulfilled promptly and with high quality as usual. The expressway appeared here in 1970 and it was the double-level one. More than thirty years later the situation in Korea changed. The state had more money, and the citizens needed more recreation zones and ecologic places for walking. And it was necessary to attract tourists by something amusing. And right then they remembered about the old “buried” Cheonggyecheon brook. The main initiator of such a project was today’s Korean president Lee Myung-bak. 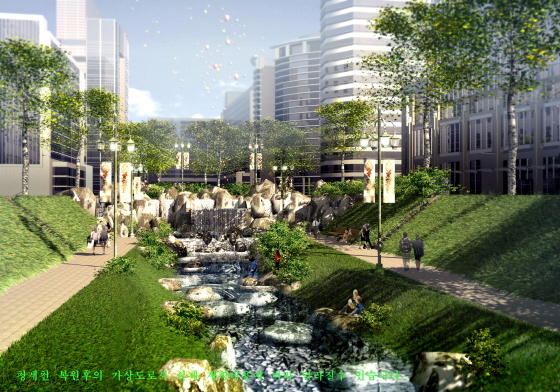 By the by his “green” project is not unique: for example we can remember “the Seoul Forest”. A plan of the Cheonggyecheon restitution in the Korean capital looked absolutely fantastic! According to the plan it was necessary to take down the thoroughfare completely, break up, manage and decorate the river bed, fill it with pure water. And all these in two years and with $ 300 million. So, the plan was fulfilled, and the modern relaxation zone opened for visitors since 2005, thousands of tourists and citizens walk here every day. All guidebooks without information about the Cheonggyecheon stream became out of date in one day. This project changed Seoul plan and face and corrected its sightseeing list very much. Per se the new Cheonggyecheon represents a gaunt landscape park at the very city centre. You can sit on the stones, wet your legs in limpid waters and admire numerous bright fountains. In the river head there are some fountains: like a candle, like a fireworks and not big double-level fountain. Downstream there is a fountain-tunnel, water here flows out from 42 holes from the height of 5 meters and makes a great high arc above the promenade avenue. One more famous fountain is a rhythmic one, water here pours down on the marble wall and with special highlight and music it makes an impression that the fountain moves rhythmically. The Cheonggyecheon is too long, it is about 10 km. There are 22 bridges above the stream but it is possible to cross it by stones installed in special way. Besides fountains there are some “walls” there. The Hope Wall adorns both sides of the Cheonggyecheon quay, it expresses pain and suffering about the division of Korea into two countries and the hope of their consolidation. The wall is faces by ceramic tiles where 20 thousand Koreans from all over the world (and from North Korea also) wrote about necessity of the country to became integral again. The Culture Wall is painted by five modern artists. Paintings on the Pangcheangdo, the hugest ceramic wall in the world, are devoted to the 22nd King of the Cheosong dynasty journey to his parents’ grave. 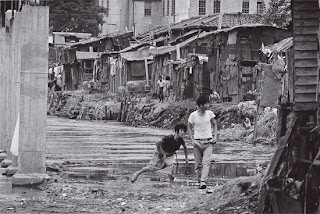 Even the slums along the Cheonggyecheon brook were reconstructed. There are five two-storied houses which are very similar to those ones where the poor men huddled together 40 years ago. And which is more the interior of that epoch is rendered everywhere. 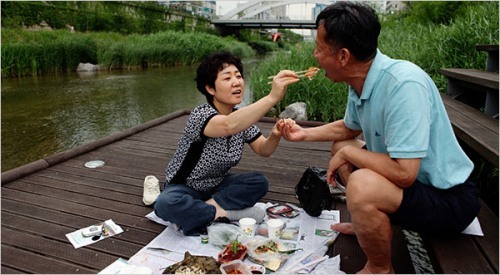 Countless markets and small restaurants cover the Cheonggyecheon brook neighborhoods. Right here in the Kwangyang market the biggest Seoul street of lunchrooms called Mokchakolmok is situated. “The fried fish alley” turns into “The whole boiled chicken alley”. All it works even at night. 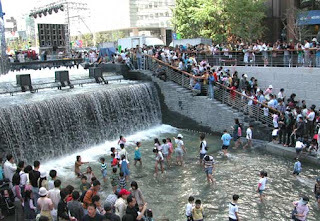 Water in the Cheonggyecheon stream is pure enough, it is possible to see fishes there and parents allow their children to swim in the river. But the constructors could not let natural mountain water to the brook, there is tap water there. Probably it is the only one disadvantage of the project. May be it will be eliminated in the near future.